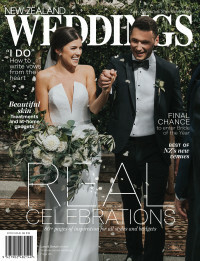 As the groom, standing out and looking your best on the big day is easy with these quick tips from wedding suit specialists, Working Style. Suiting up grooms is what Working Style do on the daily, so it comes as no surprise that they'd know a thing or two about what will make a man look good, feel great and stand out on their wedding day. Your wedding should be your best-ever-dressed day in your life. Footwear is one of the most important ingredients to any outfit because it can tie your look together and your choice will either add or remove a certain degree of sophistication to your look so always choose quality. Well-crafted leather shoes can potentially last a lifetime with proper wear, care and maintenance too, so consider it an investment and reminder of your big day. Dark brown leather lace-ups made from a single piece of leather would be our choice, ideally with a degree of hand-finished burnishing to the leather. A made-to-measure suit will turn heads. The extra refinements in construction quality and the improvements in fit will influence your look with serious x-factor. Add the style customisation and cloth options into the mix and you’ve got the opportunity to make something incredibly personalised and unique. Wear a jacket trouser combination instead, this is an especially good solution if your ceremony is outdoors, at the beach or another casual setting. The Italians call this mix-and-match look ‘Spezzato’ and have practically made it an art form. Your combination can be as formal or casual as you wish. Everything from casual linens or cottons to tidy wool or mohair right up to formal cloths like velvet or silk suit this type of outfit. A blue suit or jacket responds incredibly well to the sunshine during the summer months when most ceremonies happen. Go for something a little brighter in a plain textured weave cloth. If you want to stand out, make yourself look different to your groomsmen to provide a contrast and point of difference. The easiest way to achieve this is to give your boys a different colour or suit to wear, just make sure you make them a little more paired back.